Sabbath (/ˈsæbəθ/) (Hebrew: שַׁבָּת‎) is a day set aside for rest and worship. According to Exodus the Sabbath is a day of rest on the seventh day, commanded by God to be kept as a holy day of rest, as God rested from creation. It is observed differently among the Abrahamic religions and informs a similar occasion in several other practices. Although many viewpoints and definitions have arisen over the millennia, most originate in the same textual tradition of: "Remember the sabbath day, to keep it holy". In scripture, Sabbath is given as a day of rest, on the seventh day. The term has been used to describe a similar weekly observance in any of several other traditions; the first crescent or new moon; any of seven annual festivals in Judaism and some Christian traditions; any of eight annual pagan festivals (usually "sabbat"); an annual secular holiday; and a year of rest in religious or secular usage, the sabbath year, originally every seventh year. 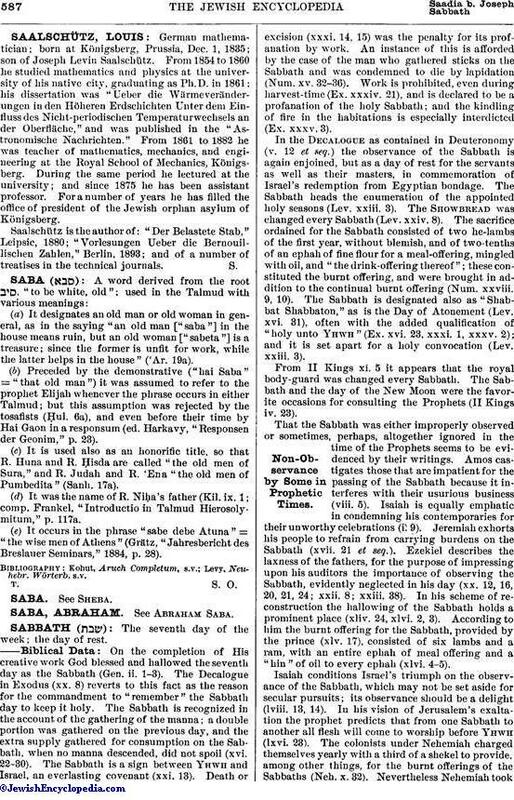 Sabbath (as the verb שָׁבַת֙ šāḇaṯ) is first mentioned in the Genesis creation narrative, where the seventh day is set aside as a day of rest (in Hebrew, shabbath), and made holy by God (Genesis 2:2–3). Observation and remembrance of Sabbath (Hebrew: שַׁבָּת‎ šabbaṯ) is one of the Ten Commandments (the fourth in the original Jewish, the Eastern Orthodox, and most Protestant traditions, the third in Roman Catholic and Lutheran traditions). Most people who observe the Sabbath regard it as having been instituted as a perpetual covenant for the Israelites (Exodus 31:13–17), as a sign respecting two events: the day during which God rested after having completed Creation in six days (Exodus 20:8–11), and the Israelites' deliverance from Egypt (Deuteronomy 5:12–15). The different Sabbaths were to be revered as a shadow of the Christ who was to come (Colossians 2:16–17) who would give mankind rest from their labors in trying to make themselves acceptable before God. For if we rest in the work of Christ on the cross, then we can cease from our own works or self efforts in trying to make ourselves acceptable before God (Hebrews: 4:9–11), however the weekly Sabbath was still to be kept even after Jesus' ascension (Matthew 24:20). Originally, Sabbath-breakers were officially to be cut off from the assembly or potentially killed (Exodus 31:15). Observance in the Hebrew Bible was universally from sixth-day sundown to seventh-day sundown (Nehemiah 13:19, cf. Leviticus 23:32), on a seven-day week. Consultations with prophets (II Kings iv. 23) were sought on the Sabbath. Sabbath corporate worship was not prescribed for the community at large and the Sabbath activities at the shrines were originally a convocation of priests for the purpose of offering divine sacrifices with family worship and rest being centered in homes. The new moon, occurring every 29 or 30 days, is an important separately sanctioned occasion in Judaism and some other faiths. It is not widely regarded as Sabbath, but some messianic and Pentecostal churches, such as the native New Israelites of Peru and the Creation Seventh Day Adventist Church, do keep the day of the new moon as Sabbath or rest day, from evening to evening. New-moon services can last all day. ↑ "cev bible, search keyword 'like sabbath'". ↑ "Constitution of Tonga". Parliament of Tonga. Retrieved 20 August 2018. ↑ Schaff’s History of the Christian Church, vol. III, chap. 75. ↑ Rev. Henry Tuberville, D.D. (R.C. ), (1833), An Abridgment of the Christian Doctrine. p. 58. ↑ Art. 28. Augsburg Confession. ↑ Rev. Stephen Keenan, (1851), A Doctrinal Catechism. p. 174. ↑ The Catholic Christian Instructed in the Sacraments, Sacrifices, Ceremonies, and Observances of the Church By Way of Question and Answer, RT Rev. Dr. Challoner, p. 204. ↑ Haas, W.S. (1946). Iran. New York: Columbia University Press. ↑ Allbright, William (1963). The Biblical Period from Abraham to Ezra: An Historical Survey. Harpercollins College Div. "Sabbath". The New Student's Reference Work. 1914.